ITEM 9. CHANGES IN AND DISAGREEMENTS WITH ACCOUNTANTS ON ACCOUNTING AND FINANCIAL DISCLOSURE. Not applicable. STRYKER CORPORATION 2014 Form 10-K 35 ITEM 9A. CONTROLS AND PROCEDURES. 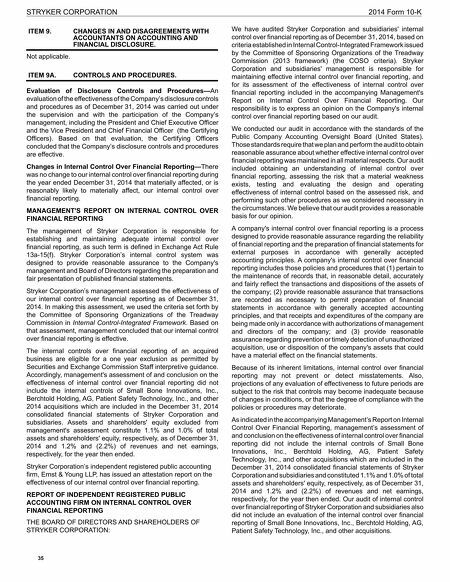 Evaluation of Disclosure Controls and Procedures—An evaluation of the effectiveness of the Company's disclosure controls and procedures as of December 31, 2014 was carried out under the supervision and with the participation of the Company's management, including the President and Chief Executive Officer and the Vice President and Chief Financial Officer (the Certifying Officers). Based on that evaluation, the Certifying Officers concluded that the Company's disclosure controls and procedures are effective. Changes in Internal Control Over Financial Reporting—There was no change to our internal control over financial reporting during the year ended December 31, 2014 that materially affected, or is reasonably likely to materially affect, our internal control over financial reporting. MANAGEMENT'S REPORT ON INTERNAL CONTROL OVER FINANCIAL REPORTING The management of Stryker Corporation is responsible for establishing and maintaining adequate internal control over financial reporting, as such term is defined in Exchange Act Rule 13a-15(f). Stryker Corporation's internal control system was designed to provide reasonable assurance to the Company's management and Board of Directors regarding the preparation and fair presentation of published financial statements. Stryker Corporation's management assessed the effectiveness of our internal control over financial reporting as of December 31, 2014. In making this assessment, we used the criteria set forth by the Committee of Sponsoring Organizations of the Treadway Commission in Internal Control-Integrated Framework. Based on that assessment, management concluded that our internal control over financial reporting is effective. The internal controls over financial reporting of an acquired business are eligible for a one year exclusion as permitted by Securities and Exchange Commission Staff interpretive guidance. Accordingly, management's assessment of and conclusion on the effectiveness of internal control over financial reporting did not include the internal controls of Small Bone Innovations, Inc., Berchtold Holding, AG, Patient Safety Technology, Inc., and other 2014 acquisitions which are included in the December 31, 2014 consolidated financial statements of Stryker Corporation and subsidiaries. Assets and shareholders' equity excluded from management's assessment constitute 1.1% and 1.0% of total assets and shareholders' equity, respectively, as of December 31, 2014 and 1.2% and (2.2%) of revenues and net earnings, respectively, for the year then ended. 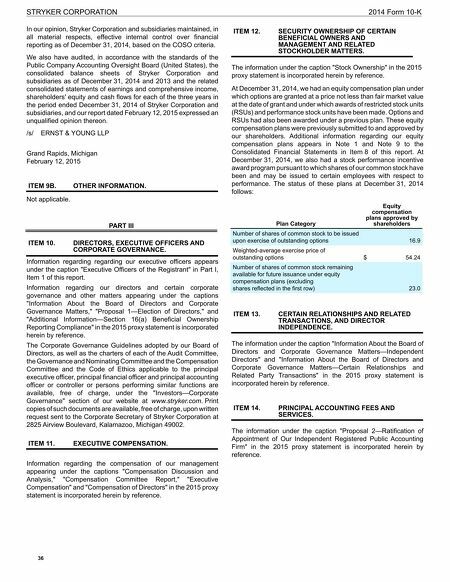 Stryker Corporation's independent registered public accounting firm, Ernst & Young LLP, has issued an attestation report on the effectiveness of our internal control over financial reporting. REPORT OF INDEPENDENT REGISTERED PUBLIC ACCOUNTING FIRM ON INTERNAL CONTROL OVER FINANCIAL REPORTING THE BOARD OF DIRECTORS AND SHAREHOLDERS OF STRYKER CORPORATION: We have audited Stryker Corporation and subsidiaries' internal control over financial reporting as of December 31, 2014, based on criteria established in Internal Control-Integrated Framework issued by the Committee of Sponsoring Organizations of the Treadway Commission (2013 framework) (the COSO criteria). Stryker Corporation and subsidiaries' management is responsible for maintaining effective internal control over financial reporting, and for its assessment of the effectiveness of internal control over financial reporting included in the accompanying Management's Report on Internal Control Over Financial Reporting. Our responsibility is to express an opinion on the Company's internal control over financial reporting based on our audit. We conducted our audit in accordance with the standards of the Public Company Accounting Oversight Board (United States). Those standards require that we plan and perform the audit to obtain reasonable assurance about whether effective internal control over financial reporting was maintained in all material respects. Our audit included obtaining an understanding of internal control over financial reporting, assessing the risk that a material weakness exists, testing and evaluating the design and operating effectiveness of internal control based on the assessed risk, and performing such other procedures as we considered necessary in the circumstances. We believe that our audit provides a reasonable basis for our opinion. A company's internal control over financial reporting is a process designed to provide reasonable assurance regarding the reliability of financial reporting and the preparation of financial statements for external purposes in accordance with generally accepted accounting principles. A company's internal control over financial reporting includes those policies and procedures that (1) pertain to the maintenance of records that, in reasonable detail, accurately and fairly reflect the transactions and dispositions of the assets of the company; (2) provide reasonable assurance that transactions are recorded as necessary to permit preparation of financial statements in accordance with generally accepted accounting principles, and that receipts and expenditures of the company are being made only in accordance with authorizations of management and directors of the company; and (3) provide reasonable assurance regarding prevention or timely detection of unauthorized acquisition, use or disposition of the company's assets that could have a material effect on the financial statements. Because of its inherent limitations, internal control over financial reporting may not prevent or detect misstatements. Also, projections of any evaluation of effectiveness to future periods are subject to the risk that controls may become inadequate because of changes in conditions, or that the degree of compliance with the policies or procedures may deteriorate. As indicated in the accompanying Management's Report on Internal Control Over Financial Reporting, management's assessment of and conclusion on the effectiveness of internal control over financial reporting did not include the internal controls of Small Bone Innovations, Inc., Berchtold Holding, AG, Patient Safety Technology, Inc., and other acquisitions which are included in the December 31, 2014 consolidated financial statements of Stryker Corporation and subsidiaries and constituted 1.1% and 1.0% of total assets and shareholders' equity, respectively, as of December 31, 2014 and 1.2% and (2.2%) of revenues and net earnings, respectively, for the year then ended. Our audit of internal control over financial reporting of Stryker Corporation and subsidiaries also did not include an evaluation of the internal control over financial reporting of Small Bone Innovations, Inc., Berchtold Holding, AG, Patient Safety Technology, Inc., and other acquisitions.